It would appear, Mr. Orr has learned his place within the U of M cronies. 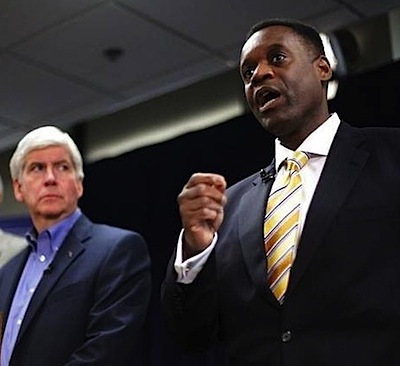 Wealthy patrons vowed to bankroll a legal fight between the Detroit Institute of Arts and the city before mediators reached a deal to save the city’s art collection, Emergency Manager Kevyn Orr testified Thursday. Orr testified about behind-the-scenes pressure applied by the DIA and patrons who believed the multi-billion dollar art collection could not be sold and was held in public trust — and explained why the city didn’t hire an auction house tied to a local billionaire. A costly, prolonged legal fight threatened to delay Detroit’s attempt to shed $7 billion in debt and emerge from bankruptcy court. While not naming names, Orr said patrons vowed to fight any attempts to sell the 60,000-piece collection. Many of Metro Detroit’s leading families, including generations of Fords, have donated art to the internationally renowned museum. “High-value net worth individuals who have an interest in the (DIA) were motivated and had the wherewithal,” to support a legal fight, Orr testified. The city believed it could sell pieces of the DIA collection purchased with city funds during the last century. Oh, it's not just the scions of long-dead donors who don't want to see the City of Detroit's assets used where they will do the most good (75...do I hear 75, 100...do I hear 100), the DIA Board is equally complicit in reaching into Michigan Taxpayers' wallets. One example was DIA COO Annemarie Erickson's "lobbying" of recalcitrant Macomb County Commissioners who dared to suggest that Macomb County Tax Dollars stay in Macomb County. Word on the street is that other DIA board members went to work on the local media after bankruptcy was filed (i.e. News/Free Press) to get them to, if not tow the DIA line, at least show the DIA in a more sympathetic light. This obviously wasn't very hard at the Freep due to Stephen Henderson's wife working for the DIA (to be fair, a fact he has repeatedly acknowledged). Baird - Snyder - Weiser. Orr said selling artwork is a short-term fix, would jeopardize Detroit's revitalization and trigger lawsuits from the Detroit Institute of Arts and wealthy patrons. "A one-time sale is detrimental to the long-term benefit of the city," Orr told U.S. Bankruptcy Judge Steven Rhodes. "Selling any art would cause a maelstrom." "Why not monetize the art," Rhodes asked Orr. Orr responded, as he did in prior testimony, that he was under no obligation to take that action, and if he chose to do so it would only further harm the ailing city. "It would be very problematic," Orr said, noting that a tri-county millage to fund the museum would disappear, as would donor and business support. "I believe sincerely it would harm (the city) irreparably." Good boy, Jones Day LIBOR toadie. Also Friday, billionaire auto baron Roger Penske testified about the city's failure to provide adequate services and the benefits of Detroit's plan to exit bankruptcy. "How is $815-million is state taxpayer money along with other "donations" to the DIA (aka "Grand Bargain") to pay off Detroit's debts (and we cannot forget the pensioners), financially more than the over $8-billion estimated for the sale of its entire collection?" And I haven't even touched Detroit's other assets (i.e. Coleman Young Airport, Detroit-Windsor Tunnel, DWSD, etc). Of course this was all pre-Kevyn Orr's "Let's make a deal" with creditors to get them to settle for pennies on the dollar. The politicians are paying more attention to the scion, than the Taxpayer!